The history of St. Luke's as presented on this page is developed from the work of the late Allan Waplington. Allan was a history teacher and from his retirement until his untimely death he devoted much of his time to St. Luke's and especially to its history. He wrote a little booklet about the history of St. Luke's. If you are visiting us and would like a copy we have a few left at £2 each. I think you'd really be surprised at the number of Formby residents who, when they come to St. Luke's, say that this is their first visit. So I say to those who've never been, come along. Set in the pinewoods, the Church is a real gem and the Churchyard, through snowdrops and daffodils and primroses and bluebells, is beautiful as well as historic. I said historic because this is an ancient site. We've got a 12th Century font from the original Formby Chapel as evidence for that. The Church before this one was destroyed in a sandstorm in 1739, a storm so bad that it obliterated all the boundary marks. Again we've got evidence for that, a new boundary marker dated 1746. It was the coming of the railway,and the prospect of a growing seaside resort that led to the building of a new church. Miles Formby had the idea. He died, but his sister, Mary, and his brother, Richard, built the nave and porch and the Church was consecrated by the Bishop of Chester in 1855.The Chancel and Aisles were added by Richard's daughter Caroline in 1897 in memory of her father. I said the Church was a gem. 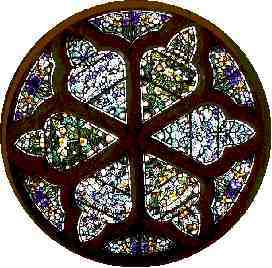 It has beautiful stained glass - the Minnitt windows in the Chancel, the St Luke window in the west wall and above all the Rose Window (Pictured to the right), which depicts all the local flowers. All the inscriptions in the west wall windows are medical because Richard Formby was an eminent doctor and a pioneer of anaesthetics in the 1830's. St.Luke, if you remember, was a doctor. Then we've still got the original pews, numbered because people paid for a reserved seat in the old days. Not everything is old for we have a modern 3 manual organ. Memorials around the walls testify to the sacrifices made by village families and the Formby family in two World Wars. And in the porch there's the gravestone of Richard Formby, armour bearer to Henry 4th, who died in 1407. He is buried in York Minster but Dr.Richard Formby provided a facsimile gravestone and was allowed to bring the original gravestone, damaged in a fire in 1840, to St. Luke's. The Churchyard remained open after the storm. 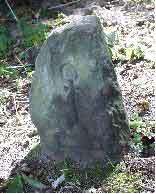 Our oldest grave dates from 1666, but the mysterious Godstone could be much older than that. We have the Village Stock, and the old Village Cross.The wooden Cross had rotted so we replaced it as a Millennium Project, at the suggestion of pupils from St Luke's School. Percy French, the famous Irish entertainer and artist, is buried in St Luke's. We even boast the first street-light in Formby. Well, I hope I've whetted your appetite sufficiently for you to want to visit the Church. We are proud of its 150 plus years of service to our Lord. Don't miss it ! It is a gem !